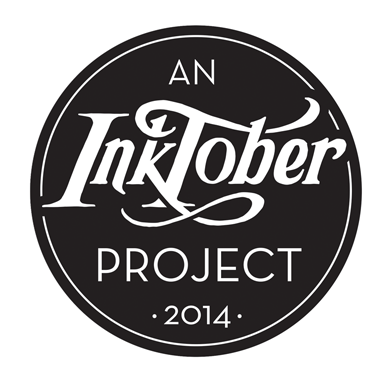 Many of you are aware that the month of October has recently been dubbed “#inktober” by artists. It’s origins date all the way back to 2009 when Jake Parker decided to challenge himself to draw one ink drawing per day in the month of October. The world picked up on it in a big way in 2013, and this year has been even bigger. There is no theme, no rules, no guidance. Just draw at least one drawing per day in ink in the month of October. Many artists draw whatever pops into their head that day. It’s been super exciting and challenging. I only missed one day so I’m proud that I have followed through so well. I have kept them all in one moleskine sketchbook and have used Micron pens sizes 1 and 2, a Fabre Castel brush pen, and most recently, an amazing Pentel brush pen that I can’t get enough of. Had it not been for my participation in Inktober, I may never have gotten that brush pen. I love that it forces me to draw a bit lighter, and that I can draw super duper thin lines as well as extremely thick black lines. It makes it easy to block in large sections of a picture. The below image shows some brush strokes I jotted down to play around. So now for the fun part! Inktober is almost over and I have lots of pretty sweet sketches. One of them AND a Pentel brush pen could be yours! All you have to do is Like my art page on Facebook and SHARE this blog post! On November 7th, I will pick a random name and that person will win an Inktober sketch and a brush pen. Hooray!